The gutted Escondido Country Club building, which was destroyed by fire the day after Thanksgiving. It is owned by Michael Schlesinger of Stuck in the Rough LLC. The city has lost patience with Stuck in the Rough’s Michael Schlesinger, the owner of the old Escondido Country Club property, and sued him for “knowingly and intentionally maintaining the property in violation of the Municipal Code,” according to the city attorney. This is the same property the city voted several months ago to allow Schlesinger to develop with 380 homes. For three years before the November 22 fire lit up the early morning the day after Thanksgiving and filled the sky over that neighborhood with a pall of black smoke— and after— the city has issued a flurry of demands that Schlesinger fence the property, shut up the partially burned building, etc. but to no avail. Several weeks after the fire, the property still hasn’t been fenced off and there is newly sprayed graffiti on the walls of the gutted country club building. Although it is considered trespass, there is nothing to prevent anyone from walking onto the property. The charges carry only fines and no jail time. According to McGuinness, since April 2013, the city’s fire and police departments have responded to calls for service to the property at least 78 times. “Twenty of those calls for service specifically involved criminal activity at the clubhouse. Since May 2013, the City has issued to Stuck in the Rough Notices of Violation (“NOV”) more than 20 times,” said McGuinness. The City filed a Certificate of Public Nuisance with the County Recorder on October 17, 2016, to address the recurring property maintenance issues. The City issued a $100 administrative citation in November 2016 to address the recurring municipal code violations. The owner paid the citation in March 2017. In September 2017, the City issued a Notice and Order to Abate addressing the ongoing violations related to the club and included a requirement to secure the property against unauthorized entry. On October 8 and 25, 2017, the Escondido Fire Department responded to fires at the abandoned clubhouse. On October 25, 2017, the City issued another Notice of Violation. “On November 22, 2017, a major fire burned at the clubhouse. On November 27, 2017, the City’s building official declared the clubhouse to be unsafe and dangerous to enter. That same day, the City issued another Notice and Order to Abate a Public Nuisance to address the structurally unsound clubhouse. 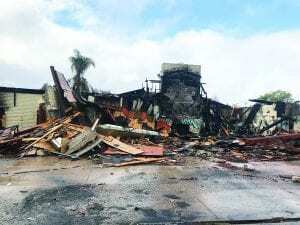 The Notice and Order demanded the owner obtain a demolition permit within ten days and to complete the demolition of the unsafe structure within 30 days,” said the city attorney. On December 19, 2017, the City Attorney’s Office wrote to the property owner to address the missed and pending deadlines from the November 2017 Notice and Order. On January 3, 2018, the City issued a Notice of Violation to address overgrown and dead vegetation located behind 1926 Pamela Ln. and a dead tree and other vegetation on the golf course. On January 4, 2018, the property owner’s lawyer wrote to the City to dispute the City’s claim that the building was a public nuisance. “Mr. Richards indicated that Stuck in the Rough would take no further action at the property,” said McGuinness. On January 11, 2018, the City filed the criminal complaint to address the recurring violations. On the same day, the City’s Stormwater Division issued a Notice of Violation to address fire debris entering the municipal storm drain system. The investigation of the November 22 fire has continued and the cause has not yet been determined. The electricity at the building had been turned off for months, so the evidence would suggest that the fire was caused by a person. Homeless people had camped in the structure and started fires to stay warm, so that is a possibility. The building wasn’t fenced or locked. Schlesinger purchased the Country Club property in 2012 and several months later shut down the golf course. The residents of the area, under the flag of ECCHO (Escondido Country Club Homeowners Organization) set their heels against a high-density development on land they believe was legally set aside for open space. In November, a couple of weeks before the fire, the city council voted 3-2 to approve of 380 homes on the property by New Urban West, the company that Schlesinger chose to represent his interests after he and the city came to a settlement of his lawsuit against it. Several weeks ago, ECCHO, under new leadership, announced that it was filing a lawsuit to challenge the council vote. We now have this guy owning our Cottonwood Golf Course- and trying to turn it into a sand. mining. Project! God help us-we have lived on top of the mountain above the Club House for 30 yesrs! What a Shame one person can destroy communities, and the local politicians let him!